Overall Condition Poor to fair. 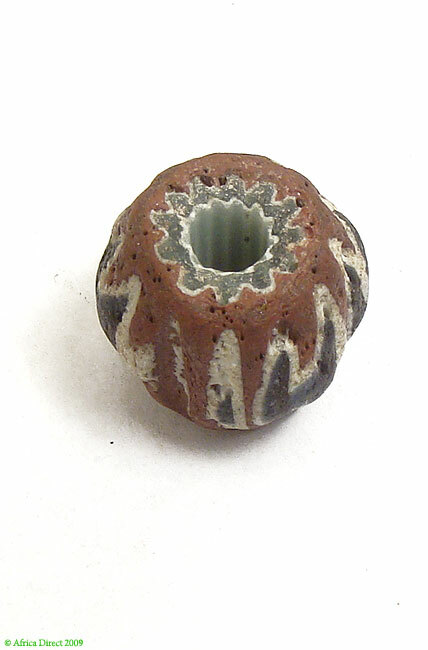 This bead is particularly chipped and weathered. Small holes. Some of our beads have traveled at least three continents, and have graced numerous owners. Small chips, corrosion, and pitting are a normal part of their patina attesting to their age and extensive use. Bead Size 20mm diameter, 20mm p-p. See picture with penny for size comparison. A small, handsome biconal seven-layer chevron. Additional information: Venetian Chevron beads are the most beautiful, recognizable and collectable of all of the Venetian "Trade Beads". Chevron beads are still being made in Venice today but in a limited quantity. They are also being made now in India and China but with a slightly different process. There are also Chevron bead makers in the world today designing and creating some beautiful beads. The two most famous Chevron bead makers today are Art Seymour, of the United States, and Luigi Cattelan, of Italy. 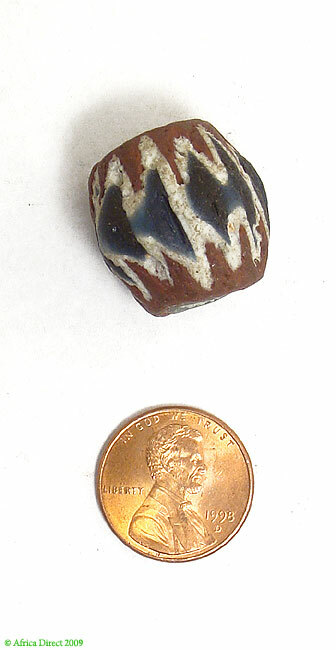 Chevrons are very popular beads, and there are many large private collections in Africa, Europe and America. These beads remain in very high regard in Africa and are still worn to show prestige, at special ceremonies and are often buried with the dea.